What I can’t tell is whether or not @change_gov is an “official” twitterstream from the transition team or just a kind soul aggregating newsfeeds. The transition team has already mentioned their plan to use YouTube for Saturday Presidential addresses; folks that followed the campaign on Twitter are hoping that channel becomes “official” as well, I guess. Its def not official. Just some kind soul (me). I actually created it because folks were complaining that obama and his peeps were not social media anymore post campaign. I thought this was short sighted for several reasons. First, the point of his campaign was grass roots. Just like the @change_gov twitter feed. 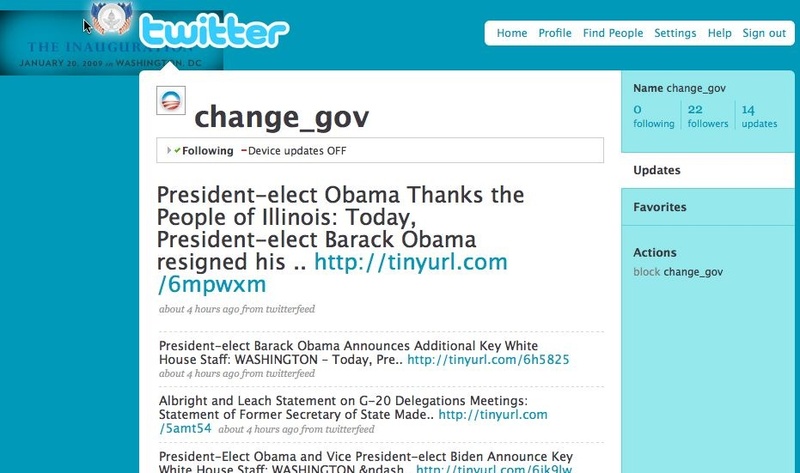 Besides did obama ever officially support twitter, or was it assumed? Second point is that I suspect there are new rules at play for Obama. Has anyone looked into the rules for official communication (via twitter, email, etc.)?? In the end it doesn’t matter. Obama is preparing a world class government, which is keeping him busy. All that i ask is continued transparency and openness. Which then allows someone like me to mash the info and get it out.